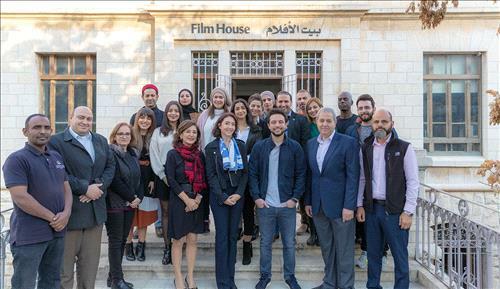 AMMONNEWS - His Royal Highness Crown Prince Al Hussein bin Abdullah II, the Regent, visited Tuesday the Royal Film Commission – Jordan (RFC), and checked on its activities and services provided to the cinema and television industry. In the presence of HRH Princess Rym Ali, member of RFC's Board of Commissioners, the Crown Prince met with a number of Jordanian filmmakers, producers and actors, who showcased their experience, accomplishments and challenges in the filmmaking field, as well as their future aspirations towards this industry in Jordan. They also commended the RFC's support to their activities. Prince Al Hussein underlined the importance of investing in Jordanian talents and the Kingdom's distinguished geographical nature to develop the filmmaking industry in Jordan and attract international TV and cinema production companies, lauding RFC' achievements in this regard. The Regent said attracting international companies specialized in filmmaking reflects positively on the Jordanian economy and has an important role in promoting tourism and heritage sites as well as the Jordanian culture. The Crown Prince toured RFC's facilities, which included the film library, the editing room and the external theater. Princess Rym briefed Prince Al Hussein on the RFC and its objectives in providing opportunities to young men and women to express themselves and refine their talents in cinema and TV. She lauded Prince Al Hussein's support the young and the filmmaking industry. HRH watched a film that included parts of Jordanian and foreign films shot in the Kingdom in addition to local and regional activities and workshops organized by the RFC.